D has started school in the last few months and it has quickly become clear that he loves to learn. He has always had an interest in learning new things but he's so excited to be going to school and having 'lessons'. He really enjoys when he gets homework home (I wonder will that last?). Since he started we have really been trying to find all kinds of activities to encourage his learning at home. I know that in primary one (reception) they don't really put emphasis on the lesson side of learning, everything is still mainly learnt through play. I find that D gets much more engaged if he is playing with toys based on characters he loves. His all time favourite character has to be Thomas The Tank Engine! We have teamed up with UK Trends to share their new range of Thomas The Tank Engine electronic learning aids! The Electronic learning aid we are looking at is this Thomas and Friends Smart Tablet. I wish I had recorded when we actually showed D the tablet. He got so excited he couldn't contain it and let out a scream of joy! He immediately set to work figuring out how it worked. As you can see the Thomas and Friends Smart Tablet has big bright pictures which have the buttons underneath, they are clearly marked to show what each button is and does. The on button is a big bright yellow button which is really responsive and doesn't require a great amount of force to get a response, which is the same as the on button which are shown using the whistle picture with up and down arrows. The final button in the bottom row on the Thomas and Friends Smart Tablet is the sound button which when pressed plays a sound which can be associated with Thomas The Tank Engine, just trains in general really. There are a few songs which will play through one at a time when the button is pressed. 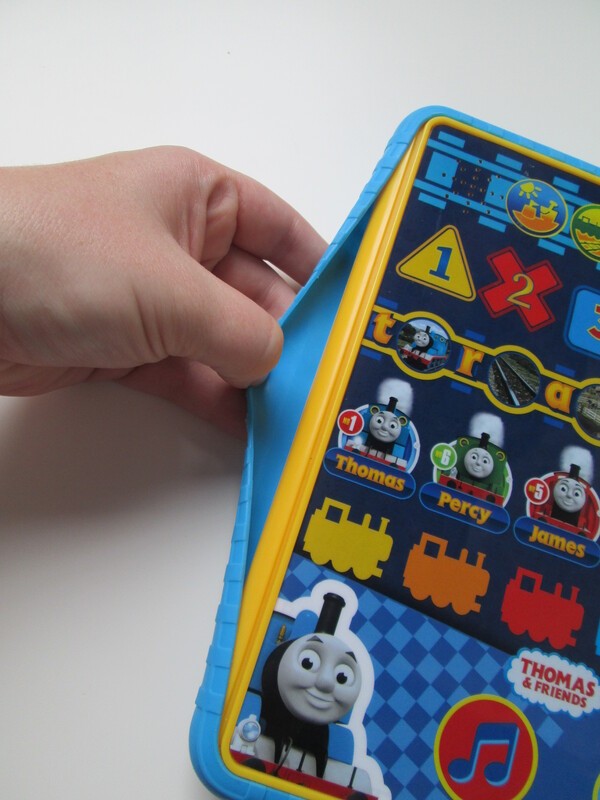 The main game part of the Thomas and Friends Smart Tablet is shown above. It works using a grid system which is really easy to follow. D picked it up in seconds and was pressing buttons left right and center! Each button along the red zone on the right hand side will ask a question. The answer to which is in one of the buttons along the horizontal line directly beside it. Each line corresponds to a learning activity including, colours, letters/ phonics, places, shapes, numbers and Thomas characters. If you press one of the buttons on the left without first pressing a button in the red section it will tell you the information about the button or picture shown. Enabling children to learn all about the items and then test themselves in a fun and interactive game that praises them! 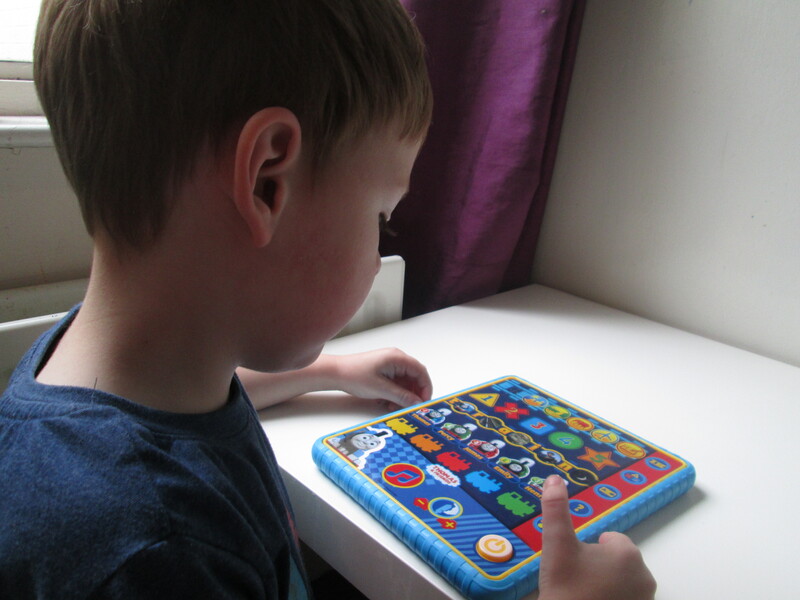 D was an expert at playing and although he knew most of the answers he was engaged the whole time, in fact he has played with the Thomas and Friends Smart Tablet daily without any complaint. The Thomas and Friends Smart Tablet will play a sound when you answer the question. If D got the question right it would play a happy tune and have children saying "yay". If D got the question wrong it would play a silly little tune and Thomas would say "Never mind. Try again". I love this! Thomas encourages your child to try again but doesn't give any sudden sounds or jolts like a buzzer which may discourage children who don't know the answer. Instead Thomas can encourage your child to choose the correct answer by trying again. D is currently focusing on the letters and phonic sounds in school. His love of Thomas and the Phonics/ letter recognition in the Thomas and Friends Smart Tablet allowed D to connect school work/ homework with playing the game. The tablet has helped us to discover and talk about more places too. We have been playing the top line of the Thomas and Friends Smart Tablet which is a game where you are asked a question about where you might find sounds or things and you need pick the correct place. We have been advancing on the Thomas and Friends Smart Tablet and speaking about other sounds we might hear or what we might be able to find if we went exploring in that place. I have found that D will be much more open to talking about what we can find or do if he is playing with the Thomas and Friends Smart Tablet at the same time. He has a vast knowledge of what we can find in a train station, on trains, at the seaside, a school and even remembers lots of items, sounds and people we might see or hear at an airport or on a plane. 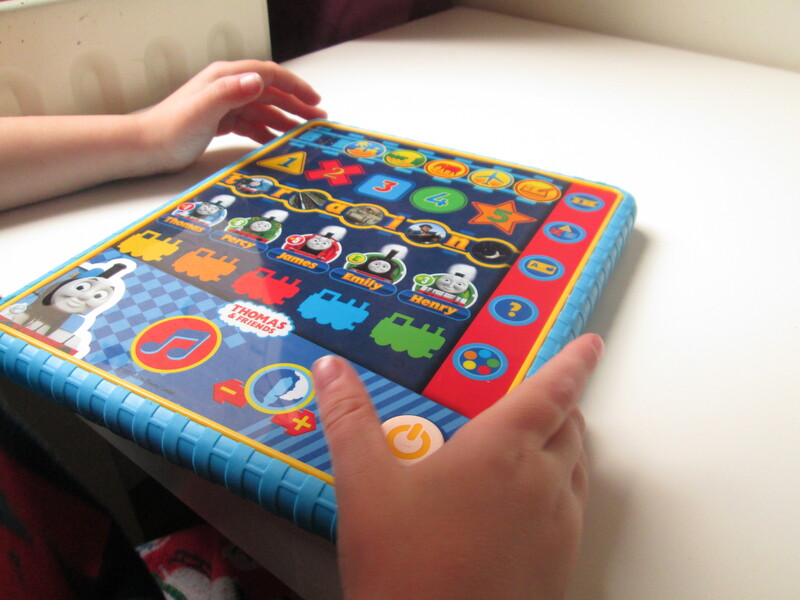 The Thomas and Friends Smart Tablet is a fantastic tool to add into family life. It is so easy to use and follow that children can play and learn alone. It can not only be played as just the Thomas and Friends Smart Tablet and the games it contains but it can also be used to advance and share a larger knowledge. Just like D and I have done with the places. I think that we will continue using this Thomas and Friends Smart Tablet as not only a great interactive learning toy but also as a tool for branching off and learning about new items, places, colours (mixing of colours and which would be made by mixing colours together) to name just a few. There is a very long list of ways to branch off and use the Thomas and Friends Smart Tablet as a learning tool to engage children and encourage their development with something they love. I think the Thomas and Friends Smart Tablet would be perfect for any child over the age of 2 years old who has a love of Thomas The Tank Engine. 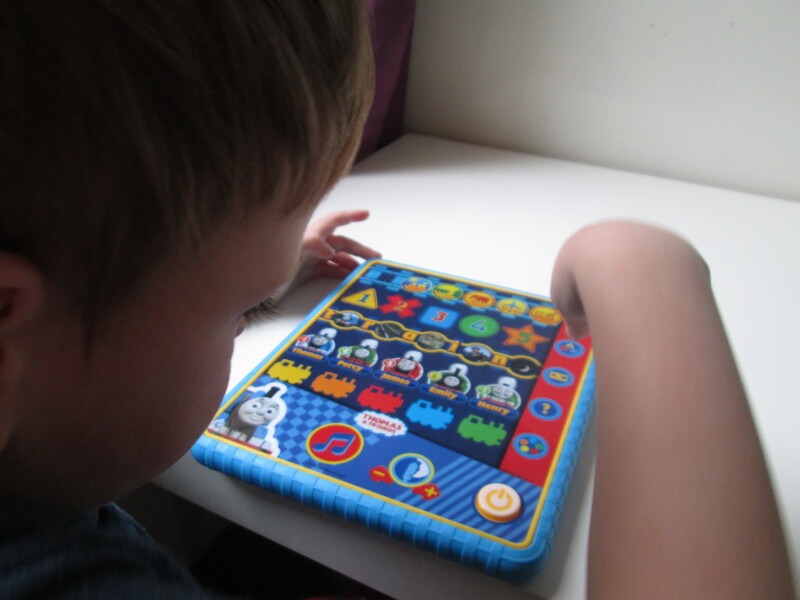 The Thomas and Friends Smart Tablet is a great for aiding children's development! You can purchase your own Thomas and Friends Smart Tablet (RRP £18 ) at Tesco. That is one of the most comprehensive and useful toy reviews I have read in a while. Thank you. I am delighted you found it useful Susan. Thank you for coming by.